Oh my, this book was so adorably cute, I can't handle it. I am officially a Jenny McLachlan fan, she just knows how to write a great contemporary. I read the first three books in her Ladybirds series and felt it got better with every single book. This is a standalone contemporary and it is my favourite of McLachlan's books so far. If you are a fan of contemporary YA, you definitely need to read this book. Megara has been obsessed with space for as long as she can remember, she dreams of one day becoming an astronaut. She is working hard on her entry into a competition to win a trip to the NASA headquarters. Her plans are derailed when her free spirited mother up and leaves without warning, going across the world to Myanmar to help the people there. She seems to have no regard for the fact she leaving Megara, a fifteen year old girl, in charge of her baby sister, their dog and their household. Sure, Meg has her grandfather nearby, but he is eccentric to say the least and pretty busy with his home brewery, plenty of chickens and about a million hamsters. Megara has to juggle looking after Elsa, going to school, as well as preparing for a competition that requires her to give a speech, and Meg just happens to be petrified of public speaking. I loved this book so much, I had a smile on my face almost the entire time I was reading it. Jenny can give her books the absolute perfect blend of emotional, hilariously funny and adorably romantic. Her characters are very realistic, which I feel is very important here when Megara is being put in such a tough situation. You need to feel like she handles it in a believable way, and she does. It isn't easy, she struggles and makes mistakes. I also loved that this explored her anxiety and fear over public speaking, something I can completely relate to. There is an adorably cute romance in this book, although I don't want to give much away and spoil anything. It was just so well done, so very cute and a great portrayal of first crush/first romance. Every scene between the two of them just put the biggest smile on my face. Her books are perfect for a younger YA audience, but they can truly be read and loved by all. I also loved all the science within this book. Megara is a wickedly smart girl, who seems completely unaware of how incredible she is. I loved her working on her speech and all the different stages it went through. I also loved the growing friendships shown within this book as well, that was another one of my favourite things about it. Honestly, the only thing that stopped me from completely, 100% loving this book was that I felt Megara's mother was never truly held accountable for her actions. It almost felt like it was being excused at one point, and it shouldn't have been. Her actions required social services intervention and I kind of wish that had happened, it was what she deserved for how selfishly she acted, not once considering her children's welfare. It was just one little thing that nagged at me whilst I was reading. Absolutely everything else I loved and adored, so I will be recommending this to all! I received a copy of this book from Bloomsbury in exchange for an honest review. Aw I'm so glad you liked this! I've not heard of it before but it sounds so cute! 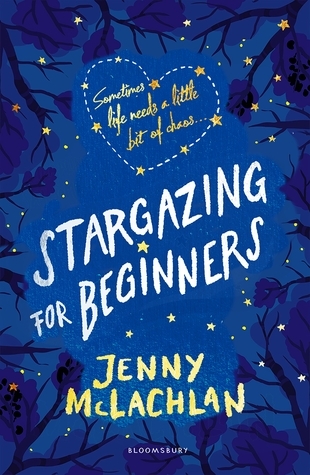 I haven't heard of this one before (I haven't heard of many books while not blogging), but I've wanted to read something by Jenny McLachlan for a while now, and this sounds like the perfect contemporary to devour in one go! I'm so glad you enjoyed this one, Charnell! Ahh this sounds AMAZING! I'll definitely be buying it as soon as it's published because it's got a character who loves science and space and I LOVE THOSE TWO THINGS. Great review! I haven't heard of this book before but it sounds like this is one adorably cute read. I really like the idea of the romance being so good but it also being about striving for your dreams and making them a reality. Seems like something I would enjoy reading a lot!